Tarzan. Planet of the Apes. Not the two most likely ingredients for a success. But with BOOM! 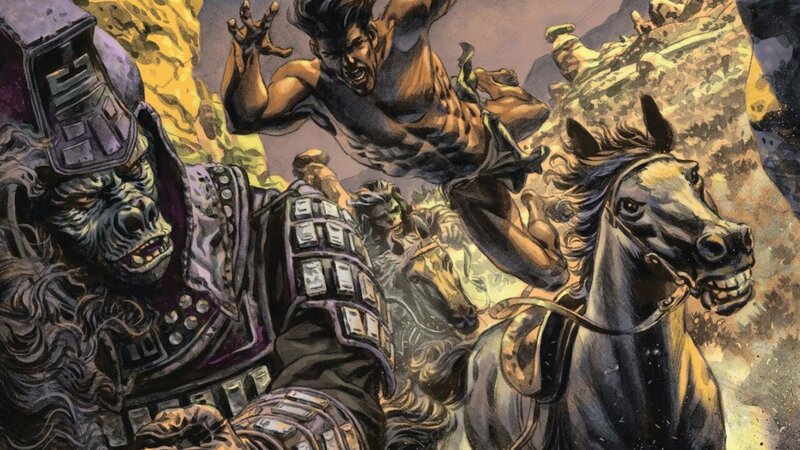 Studios and Dark Horse Comics collaboration Tarzan on the Planet of the Apes, a victory is had. The two entities hold a special place in science fiction and fantasy. Tarzan came about in 1914 at the hand of writer Edgar Rice Burroughs in his novel, Tarzan of the Apes. The book was so successful it spawned 25 sequels as well as retellings on radio, TV and film. As for Planet of the Apes, the original 1968 film was adapted from writer Pierre Boulle’s novel and became an instant sci-fi classic. That movie brought about four sequels, as well as two separate reboots, leading into this year’s War for the Planet of the Apes. The series was so popular it spawned a TV show, cartoon and comics. But putting both sci-fi and fantasy icons together in one story—how could it work? For Tarzan on the Planet of the Apes, it surprisingly does. Tarzan on the Planet of the Apes begins with a little time travel. First up is North America 2016, where Tarzan attacks a world ruled by apes. Quickly, we travel to West Africa 1901, where a young Tarzan is playing in the jungle with his ape brother, Milo. While horsing around, the two stumble upon a triceratops. Sound absurd? It is, but as one keeps reading and suspending disbelief, the story works well. The two boys take this finding to their parents, Cornelius and Zira—the same Cornelius and Zira who befriended Charlton Heston in the original Planet of the Apes film. The boys share a tale of the dinosaur and the hole in the sky, one that brought Cornelius and Zira to this time. Not only that, but a human threat has come to West Africa in the form of Greystoke, a relative of Tarzan. Written by Tim Seeley and David Walker, Tarzan on the Planet of the Apes is a five issue mini-series. Seeley and Walker create a creative and complex storyline. Leaning heavily on the original Planet of the Apes lore, the story is fun for both nostalgia and entertainment purposes. The only detraction is that the storyline gets complex at times with different characters from different times crossing paths, but it’s a small distraction. 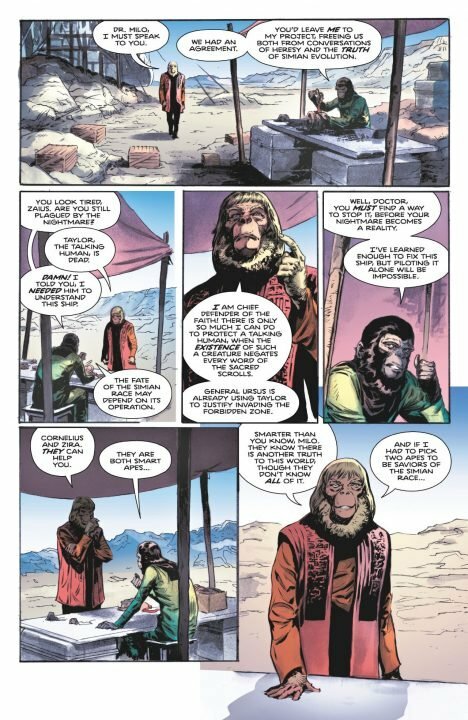 On the whole, Tarzan on the Planet of the Apes is more than just a quirky crossover; it is a quality story with tight dialogue and fast-paced, high-octane action. Artist Fernando Dagnino does a terrific job bringing Tarzan on the Planet of the Apes to life. His illustrations harken back to the Planet of the Apes film as well as having a timeless feel. The emotion he applies to the characters and his action is his greatest strength in Tarzan on the Planet of the Apes is—mostly in tight, hand-to-hand combat. All in all, Tarzan on the Planet of the Apes was a delightful surprise. It not only offers a great sense of nostalgia for fans of both franchises but it goes far beyond expectations, taking readers on a lively adventure through both space and time. Tarzan on the Planet of the Apes is a delightful surprise. For those who love both sci-fi/fantasy classics, this comic mini-series is for you.